Hey y'all-- We've been mixing minds with our friends at Queen Moose TX. When we saw this 'doodle' by our friend Tara we knew we wanted it! I had just recently re-read the story of Lydia in the Bible and this just jumped out at me! Since most of our readers are women we think this saying might hit home and resonate with you as well as the story of Lydia! We've referenced her story on the shirt! As women we have the opportunity to earn income and/or provide extra income to the family budget (if a stay at home mom, said tongue in cheek as most stay at home moms don't really stay home!) Lydia was a worker- she was not 'at home' as most women of the day were. She was out earning money- and not just small amounts- she sold expensive Purple cloth, the Bible does not hesitate telling us exactly what she did! So many of our readers have full time jobs, part time jobs, stay at home jobs-- Entrepreneurial jobs! You should not hesitate to tell people what job God has put you in. He has you where you need to be at this point of your life. Ladies (and our guy friends) --- Lydia worshiped God, however, it tells us that as she 'listened' - the Lord opened her heart and she accepted what Paul was saying (which was God's word!)! A lot of people claim to be a 'Christian' used as a noun- we need to be Verbs--- walking the walk and talking the talk.... When we take in His word and apply it to our lives we are Truly FREE! However, as women we also need to be BRAVE to understand how His word plays a role in our lives. His word stays the same- However, it has a different effect on each of our lives! How we put it to use is for Him to tell us! Honestly--- We've got to read and breathe God's word in order to be truly FREE from the lies all around us and the desires of the evil one. Be BRAVE when reading God's word - ask Him what he wants you to understand from it. And if you are working somewhere in life right now and you don't know why- Ask Him! He will show you why you are where you are! Think of the people that Lydia influenced once she was Baptized!!!! I can only smile thinking of the conversations she had with people after her encounter with the disciples--- I bet she was selling the expensive Purple cloth right and left! So we want to share this shirt with you at a Pre Barn Sale Special Price! Share God's word with others through this.... Your Story Matters and it might change someone's Life!! Send us an email to order one and you can have it shipped for a small fee- or pick it up in person at the Barn Sale!!!! 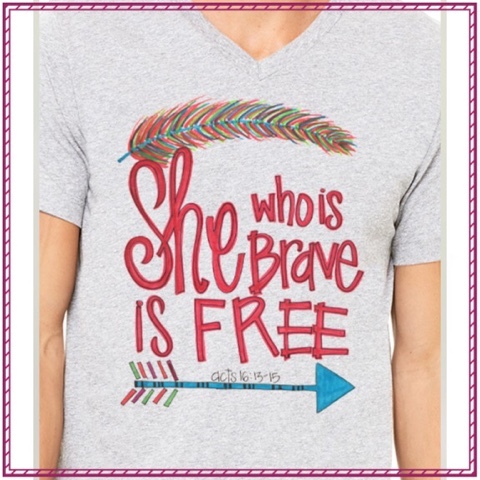 They are a unisex fit with a V neck which is flattering on all women! email us here Rusted Gingham and let us know how many and what size!!! Pre Barn Sale Price is $32 --- they will cost you a few dollars more at the Barn! Final pre sale date is Oct 20th!!! !